At this critical time in the general aviation financial world, the last thing we need is Washington, D.C. continuing to tell the media that owning and flying a business aircraft represents wasteful greed and excess. 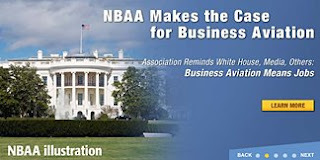 This week, National Business Aviation Association (NBAA) President and CEO Ed Bolen fired off a letter to President Barack Obama's White House that is so perfect and so eloquent that I am choosing to publish it here verbatim. If you wish to download a PDF of this letter from NBAA to circulate, here is that link. People in the general aviation community are feeling the pain of a serious recession and the heartbreak of job losses. Like all Americans, we believe that any federal dollars going to address the economic situation should be spent with great prudence. While we support the need for wise stewardship of taxpayer dollars, we are deeply concerned about a pattern that seems to be emerging in which policymakers are discouraging and disparaging the use of general aviation for business purposes. While the actions may be directed at a certain individual or a certain company, the reality is that a vital U.S. industry is being devastated by the economy, and some of the recent steps by policymakers are adding to the pain and job losses. This has to stop – policymakers need to understand that general aviation is about jobs. The numbers are clear. The vast majority of general aviation aircraft in the world are manufactured, operated, serviced and maintained in the United States. Even the minority of those planes manufactured outside this country are often “completed” (painted and interiors installed) in the U.S. These completions add electronics, automation systems, engines and other aircraft components manufactured here in the U.S. by many small businesses. In fact, general aviation manufacture is one of the remaining sources of good manufacturing jobs in this country – the kind of jobs we can keep in the U.S. in the 21st century. It is also one of the few industries still contributing to the nation’s positive balance of trade. Equally important, general aviation means jobs in small towns and rural areas across the country. About 100 communities have lost scheduled airline service over the past 18 months, and in many of those towns, businesses look to general aviation - the use of their airplane - as the transportation lifeline for staying in business and preserving the local workforce. Of course, the flights made by these businesses require support, which also leads to job production. Schedulers, dispatchers, maintenance technicians, pilots, training professionals, and airport employees are just a few of the many types of workers involved in general aviation flight support. These jobs are important to the people who perform them and to the companies they work for. Additionally, general aviation helps preserve jobs at small companies that are too small to afford to have people out of the office for long trips, or be unable to work en route. That’s because, like an investment in good computer software, a business airplane boosts employee efficiency and productivity. As I write this letter, I’m reminded of another time that the White House and Congress were compelled to act in recognition of how closely general aviation is tied to jobs across the country. Fifteen years ago, general aviation was on the brink of being grounded in the U.S. In response, Congress overwhelmingly passed and President Clinton signed into law the General Aviation Revitalization Act of 1994, because we all understood that this industry and the jobs associated with it were too important to lose. That legislation paved the way for general aviation to survive and continue generating jobs and innovation. But today, a different threat confronts general aviation – the same threat that confronts most other industries – the economic crisis. The people and businesses in the general aviation community are weathering one of the worst economic storms anyone has ever seen. Every manufacturer has been forced to scale back production and lay off workers. General aviation flight hours are down sharply. The inventory of airplanes available for sale is at an all-time high. General aviation airports are operating in the red. Our concern is that if Washington takes an excessively dim view of general aviation – one that leads to policy proposals banning all use of business airplanes for any company – it would accelerate the downward spiral of the industry. Instead of discouraging companies from accepting and using business airplanes or any other strategic business asset, policymakers should be looking for ways to increase general aviation manufacturing jobs, promote economic development in communities without commercial airline service, and facilitate productivity and efficiency at companies trying to do more with less. On behalf of its 8,000 Member Companies, the National Business Aviation Association stands ready to discuss the importance of general aviation at any time. Until then, my thanks for your consideration of this matter.